Chinese tourism to Russia: What are the obstacles to a boom? In 2014 China became the leader in inbound tourism to Russia, yet Russia receives only 1 percent of the total number of Chinese tourists worldwide, and the growth seen in 2014 was only 5 percent. What is preventing a higher rate of growth and how can Russia overcome these difficulties? According to official statistics from Russia Tourism, Chinese tourism to Russia continues to grow but the speed of growth has reduced noticeably. In 2011 growth was 35 percent, in 2012 it was 47 percent, in 2013 – 43 percent, and in 2014 – only 5 percent. The chairman of non-profit organization World Without Borders, Ivan Vvedensky, explained that this trend is simple: 2012 and 2013 were designated years of Chinese tourism in Russia and Russian tourism in China. “A large number of trips were organized over these years at a governmental level, there were many government-funded delegations. And when this campaign finished, we were afraid that Chinese tourism to Russia would even drop,” he said in comments made to RBTH. However, this turned out not to be the case. Chinese tourists have not only not given up their position but have moved into first place among foreign tourists, pushing out traditional leader Germany with 1.125 million tourists. Yet this represents just 1 percent of the total number of Chinese tourists worldwide: The total number of Chinese tourists traveling in the world in 2014 was 107 million. Unsurprisingly, at the third Russian-Chinese Tourism Forum on March 17 both sides agreed that the potential was far from being exhausted. What is preventing a growth in tourism? Chinese tourists are not only the world’s most numerous and its biggest spenders (taking first place in international ratings for purchasing luxury goods), but are also the most patriotic. "What language sounds the nicest? Their mother tongue. What food is tastiest? What mom cooks. What place is the most comfortable? Where you feel at home" – this is a description of Chinese tourists’ preferences, according to Li Chuangxin, a representative of the Chinese Academy of Tourism. Even when overseas, Chinese people want to feel like they are at home and act out of habit, therefore, they are attracted by that country, that city and that hotel which best creates a familiar atmosphere, said a representative of the Pacific-Asia Tourism Association (PATA), Ivy Chee. “Many Chinese use Russian airports as transits when flying to different countries in Europe and spend several hours in Russian airports. However, there is not a single restaurant at Sheremetyevo Airport in Moscow with Asian cuisine. There are no boilers with hot water where you can quickly prepare noodles. 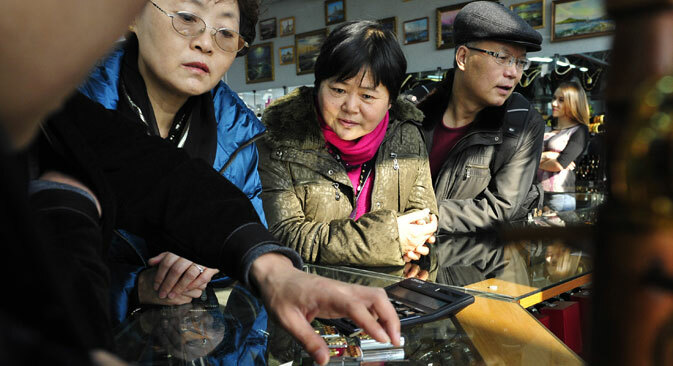 This does not make things easy for Chinese tourists,” she said. According to Chee, as a rule, young Chinese today can speak English, but for older tourists the absence of waiters or aircraft staff who speak Chinese is a real problem. How to overcome these problems? To resolve these problems in adapting Russian tourist facilities for Chinese tourists, World Without Borders has joined a program called China Friendly, which it is now promoting in Russia. By joining the program, tourist companies, hotels, restaurants, museum and other organizations interested in Chinese tourists can receive carefully-thought out instruction on how to create more attractive conditions for Chinese visitors. “The first thing that is necessary to join the program is, of course, motivation and understanding of what tourists from China need,” said China Friendly’s program director in Russia, Anna Sibirkina. Everything else is a matter of detail: Chinese speaking staff, signs in Chinese, visa-free entry to Russia, etc. It is also quite important to be able to pay using China’s domestic bank card system UnionPay, said the operational director of the company Mercury, Yury Polyakov, who owns the luxury department stores TsUM in Moscow and LTD in St. Petersburg. “There are three conditions which enable us to increase the number of Chinese tourists to Russia, especially those who love to shop. These are: Chinese speaking staff, the ability to pay with UnionPay and the opportunity to receive tax returns before flying out from the airport,” said Polyakov. He also added that while the first and second conditions are being met more and more often in Russia, the third one has so far not been implemented anywhere in the Russian Federation.